According to Statistics Canada, 1 in 7 Canadians live in poverty. 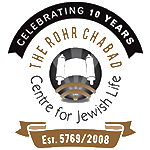 The Kosher Food Bank was born out of a partnership between Chabad and the Waterloo Region Food Bank, when we realized that a need existed within the Jewish community for a food bank which was completely kosher . The KFB is open by appointment only, and recipients are welcome to come and select the items they desire themselves, to promote dignity and privacy. We also distribute food baskets before High Holidays and Pesach. Currently, the KFB offers a wide selection of dry goods, produce, kosher chicken, fish and meat products, and kosher breads. The operation and expansion of the Kosher Food Bank is possible only due to the support and kindness of people like yourself - please make a donation of food or funds today. Contact us to clarify which food items are accepted. We are most in need of donations of kosher chicken, meat and breads, as the dry goods and produce are supplied by the main Food Bank. Those kosher products are available for purchase at Vincenzo's and Sobeys Ira Needles. If you know of someone who is in need of the Kosher Food Bank's services but is hesitant to reach out on their own, please notify us so that we can reach out to them. KW Ulpan - Learn Hebrew!